If one wished to characterize the Low Mass in a single word, that word might be PEACE. And if one were searching for a word to describe the High Mass, it might be GLORY. These are the two facets of the mystery proclaimed in the song of the angels: “Glory to God in the highest, and peace on earth to men of good will” (Lk 2:14). God on high deserves to receive the homage of what is most beautiful and most sublime, which we see in a Missa cantata, even more in a Solemn High Mass, and most of all in a Pontifical Mass. It is no less true that the Son of God entered our midst as the Son of Man, with a quiet humility reflected in the quiet prayer and noble simplicity of the Low Mass. Whether high or low, full of splendor or full of silence, the traditional Mass puts one in a state of prayerful attentiveness and leaves one in a state of simple adoration. Sung Mass was — and, in a certain sense, still is — the normative liturgy of the Roman Rite. Even as Byzantine liturgies are sung as a rule, so too was the Roman liturgy, once upon a time; its sung form long antedated the development of the recited Mass, and it is still the ideal when circumstances warrant, as far as the Magisterium is concerned. Unfortunately, the Low-Mass-as-norm mentality is very strong and holds people in its grip. A friend wrote to me that in her local TLM community, about 40 attend the Sunday High Mass, whereas the Low Mass is packed with faithful. They like the fact that it’s earlier in the morning, offers quiet time for praying privately, and doesn’t last too long. This reaction, in turn, could signify several things. First, it cannot be denied that people of the Western world (perhaps especially Americans) tend to be impatient with ceremonial or religious ritual and would rather fulfill their obligation as efficiently as possible. Sung in full from the Liber Usualis, the great interlectional chants — I refer to the Gradual and Alleluia, or Gradual and Tract, or Paschal double Alleluia — would undoubtedly seem like a sojourn in Purgatory for some. The sung Mass is a feast for the senses and the spirit, but it definitely requires more work to pull it off and more leisure to appreciate it, and busy Americans are often unwilling to invest either the extra work or the larger leisure. A second and related problem is the atrocious lack of musical education among clergy and laity, which discourages the attempt to sing the Mass. It may sometimes be true that the musical resources are simply lacking. But most of the time, the problem is a combination of unreasonable expectations and people who are a bit lazy. The chanted Mass does not have to sound professionally recordable. It is enough that all that should be sung is sung, with the correct texts and approximately the right melodies. Third and most deeply, the clinging to Low Mass is a sign of human beings starved and starving for silence and a kind of solitude. Many are attracted to the traditional Latin Mass precisely because it is, and comes across as, an unhurried, earnest, intimate encounter with God, like Moses before the burning bush, a form of worship that is totally given over to Him and induces in the worshiper a filial fear, a hushed reverence before the Lord of heaven and earth. The very posture of the priest and the long moments of silence emphasize that this is all about Him, not about you, except inasmuch as you belong to Him. Indeed, this form of the Mass is so theocentric that it seems, in a manner of speaking, not to care what you think or feel — which is a tremendously liberating thing. How freeing it is to enter a church, kneel, and get swept away in the great prayer of the Eternal High Priest, an offering that is so much greater and loftier than you and your wretchedness, yet to which you are still invited to contribute your widow’s mite, knowing that Christ will accept it and multiply it! 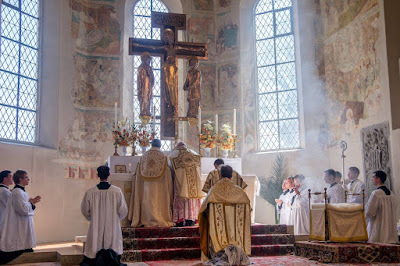 All of this is provided by both the traditional Low Mass and the High Mass, but not by a reformed liturgy that seeks above all to establish contact with the congregation at hand and to mobilize it for action. There, the individual worshiper is put on the spot, made the object of appeals and the subject of demands, and hurried along to communion time, while being habituated to feeling comfortable around the sacred. There is little if any habituation in the fear and wonder that should be our dispositions towards the mysterium tremendum et fascinans. As we know, the “four-hymn sandwich” that dominates almost all Ordinary Form parishes today is not a new invention of the rebellious 1960s but derives from the permission to sing vernacular hymns at Low Masses in the decades preceding Vatican II. In order to solve this problem of communal sentimentalism, which stood in tension with the liturgy’s public, formal, objective character and with the people’s genuine participation in the liturgy as given, the Council itself called for the use of Gregorian chant, Renaissance polyphony, and newly-composed music that would look to these great models and emulate their qualities. Tragically, we remained in the rut of the four-hymn sandwich, except that the schmaltzy Victorian style of yore was replaced by a pseudo-folk or light-rock style. No formal change occurred, merely a material substitution. All the underlying assumptions and expectations stayed the same, and the call to invest oneself in the liturgy as such, so that one could truly live a vita liturgica, went unheeded. It is, of course, possible to outfit a Low Mass with music that possesses the proper qualities by singing chants (Adoro te, Ave verum corpus, etc. ), picking the right organ music, and using tasteful hymns, but all this is still a far cry from the High Mass or the Solemn Mass, which is the liturgy-as-music and music-as-liturgy. If today we do not take seriously enough the difference between singing the Mass and singing at Mass, or between an exalted public celebration and a pared-down private celebration, we will be in danger of replicating a new form of 1950s Catholicism that risks toppling down again like a house of cards through a failure to embrace the fullness of our liturgical tradition. As much as possible, the sacred liturgy needs to be celebrated in full, in its ritual and musical integrity, if we hope to see a revival worthy of our tradition and a lasting cure for the poisons of rationalism and utilitarianism that have crept into nearly every aspect of modern life. The liturgy must be seen not only as truth, but as the splendor of truth, the manifestation of God’s glory. Hugh indeed never lost sight of the fact that a bishop is first and foremost the chief liturgical minister. He would never permit the least slovenliness in singing the Office. 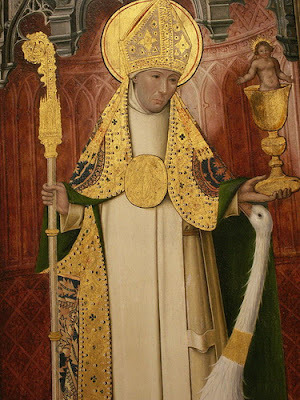 Once he was assisting at Mass with another bishop, Hugh de Nonant of Coventry. They were then to dine with the King. Not to delay the royal dinner, the Bishop of Coventry wanted a Low Mass and began to read the Introit of a Confessor, Os justi, in his speaking voice. Hugh would have none of it and began to chant the Introit with all the notes of the Proper. Like St. Dominic who sang his daily Mass, Hugh seems to have followed an excellent principle, the reverse unfortunately of that obtaining today: don’t say Mass if you can sing it. One can imagine his judgment of the numerous parishes where the Mass is not sung, even on Sundays and great feasts. This article is not intended to be an argument against weekday Low Masses or “private” Masses, which have their place and their own meditative beauty. It is rather an appeal to elevate our communal worship on Sundays and Holy Days, so that we may observe these days in fitting solemnity, using all of our powers of body and soul, and drawing upon all the gifts of our faith. Note that I say “noble simplicity,” which cannot be manifested by a stripped-down liturgy that has substituted the simplistic, the superficial, and the banal for the purity, intensity, and “thickness” of traditional liturgy, which nevertheless speaks more forcefully of the numinous and the ineffable, and in this way reaches souls at a deeper level more successfully. Of course, having to take care of little children can distract us, but even parents do get to pray occasionally at the traditional Mass and appreciate how it orders, quiets, and animates the soul. See my series: (1) “Song Befits the Lover”: Understanding the Place of Gregorian Chant in the Mass; (2) Why Gregorian Chant? And Why Sung by the People? ; and (3) How We Should Sing—And Why People Don’t Sing. In one of its unguarded moments, namely, chapter 6 of Sacrosanctum Concilium, the Second Vatican Council even held up the chanted Latin Mass as the ideal, but don’t tell the liturgists: they don’t like to be reminded of that earlier phase in the Teilhardian evolution of cosmic consciousness. You may be labeled a leftover Baroque primate. See Guardini's fine insights on this matter. I am not saying that 1950s Catholicism was not stronger and healthier than the Catholicism of today. Denial of this would be idiotic. But I am concerned about certain regrettable habits or patterns already in place in the 1950s that provoked some of the radicalism, indifference, and apostasy that followed. From the delightful book Neglected Saints by E. I. Watkin (New York: Sheed & Ward, 1955), 63–64. See this article for an appreciation of the silent Low Mass.